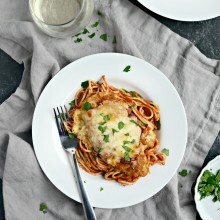 Craving an easy, light and healthy pasta dish? 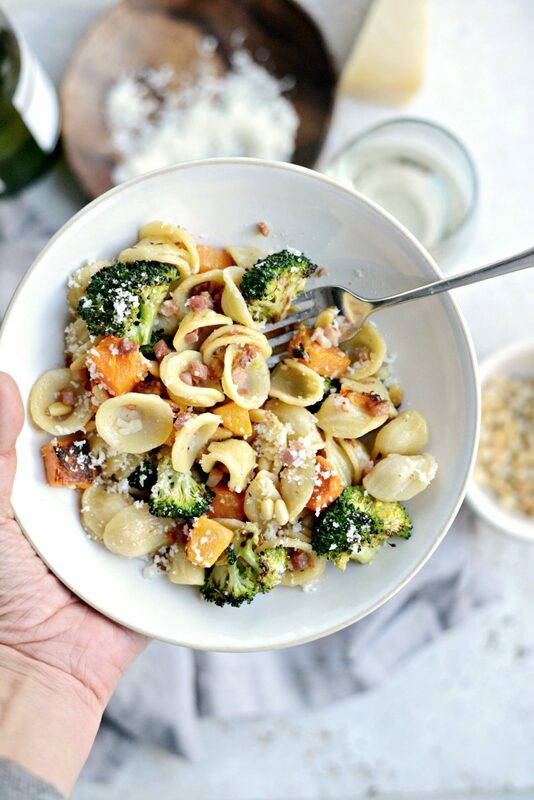 Well, this orecchiette pasta with crispy pancetta, sweet and buttery butternut squash and broccoli will no doubt satisfy! 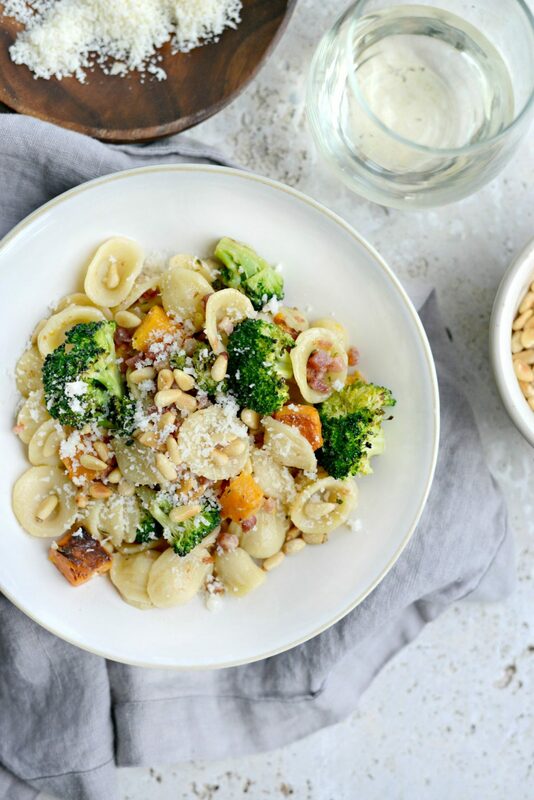 I serve it in bowls with extra Parmesan cheese, toasted pine nuts and a glass of sauvignon blanc 😉 . Happy Monday! I hope you all are recovering well after yesterday’s game and food coma? I’ll be honest, today I have zero desire to shop for food, cook food or even look at food. I’m food-ed out. Like big time. Dinner tonight may be grilled cheese. 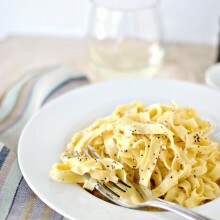 Keeping that you may be feeling the same, I wanted to share an easy, scrumptious and light pasta dish for days your just can’t even. 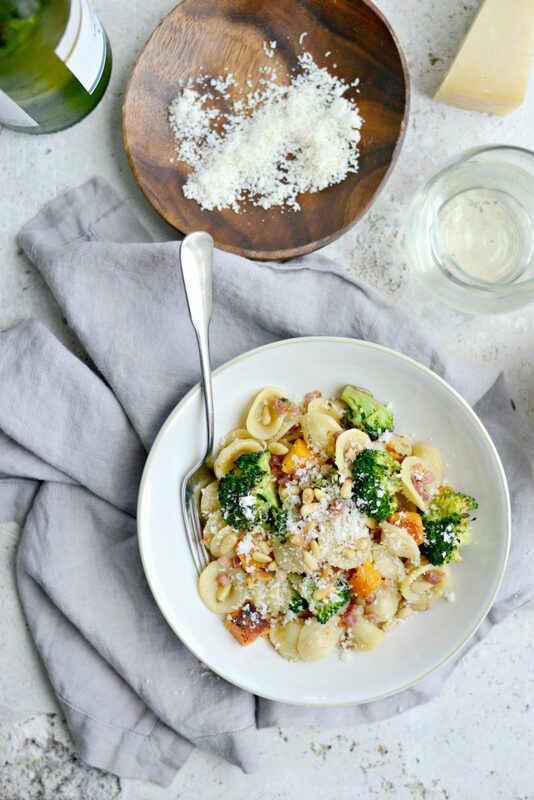 What I love most about this orecchiette pasta dish is that if you’re in a time crunch, you can totally grab the pre-chopped/diced/measured stuff. 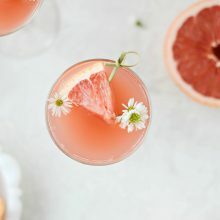 For example, in the produce section at my local grocery store, they have a section of fresh short-cut ingredients that are either already diced, sliced or pre-cut. 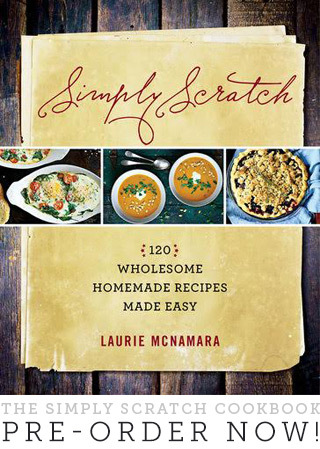 Which I take full advantage of from time to time, and this recipe is one I can use those in. Although I did chop my own broccoli florets, I did purchase a package of pre-diced butternut squash (Thanks Kroger!) and the pre-diced pancetta. I also didn’t need to buy a whole butternut squash. I only needed a couple cups so doing it this way is such a time saver and I love it. 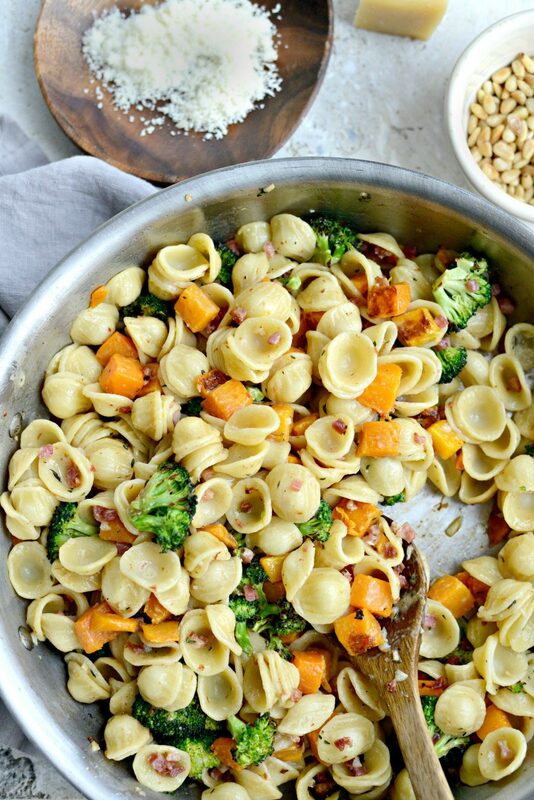 Place the butternut squash and broccoli on two separate baking sheets. Quarter sheet pans work great here! Then drizzle with olive oil and season with kosher salt. 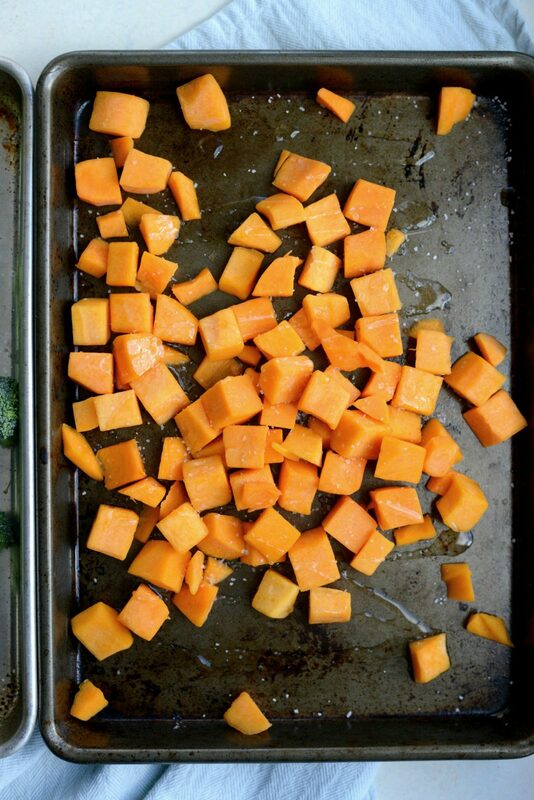 Roast the squash at 425° for about 20 minutes rotating the pan halfway during roasting. Once done remove the pan and set off to the side, then crank the heat to 500°. 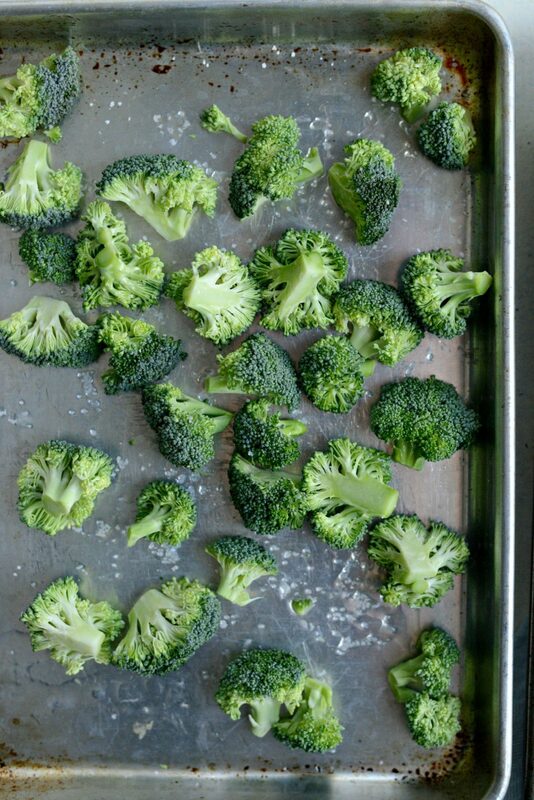 One preheated to the new temperature, slide the pan of broccoli in and roast for 8 minutes, rotating the pan halfway through. Then remove and set off to the side. Meanwhile (while the vegetables are roasting) bring a pot of salted water to boil and cook pasta according to package directions. Also, add 1 tablespoon of olive oil and the pancetta to a large 12-inch skillet and heat on medium. 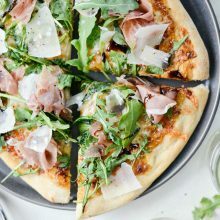 Cook for about 10 to 15 minutes or until the pancetta is crispy. Use a slotted spoon to transfer to a paper towel lined plate. When pasta is al dente, reserve 1 cup of the pasta water and then drain into a colander set into your sink. 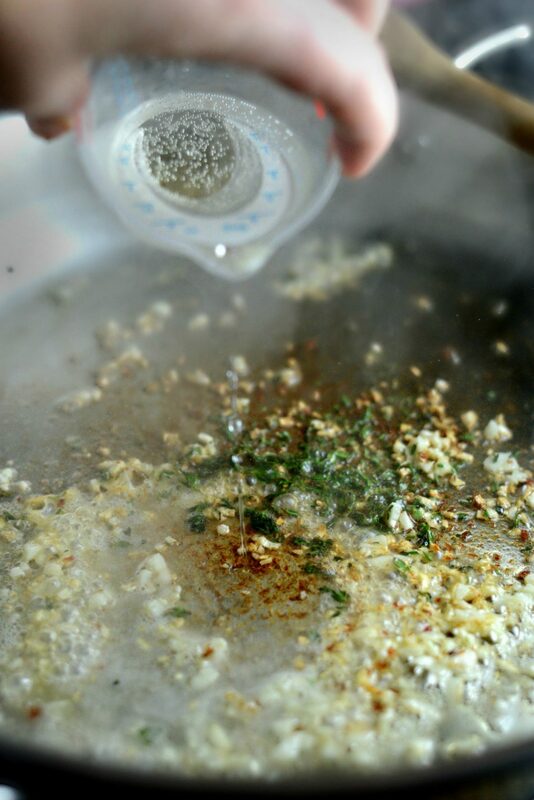 Then add the garlic, stir and cook 1 minute. Next add in the chopped fresh thyme and 1/4 cup white wine and cook until reduced by half. 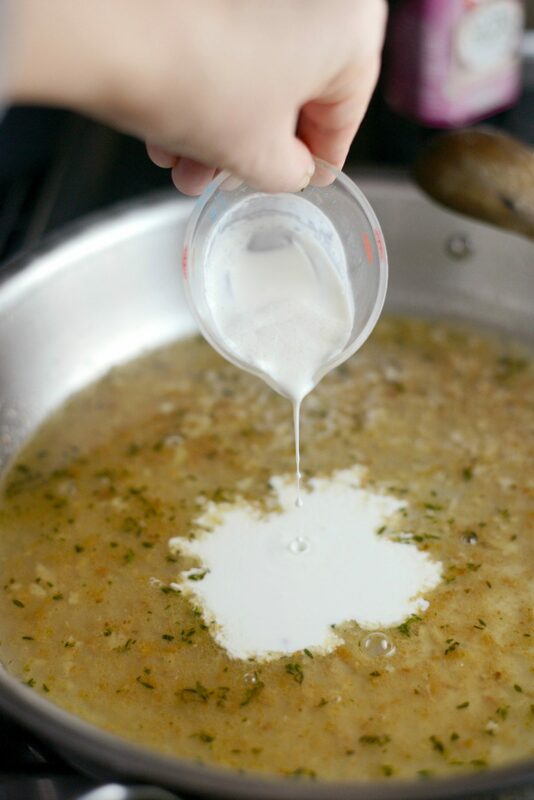 Next pour in 1/2 cup of low-sodium chicken broth and 2 tablespoons heavy cream. 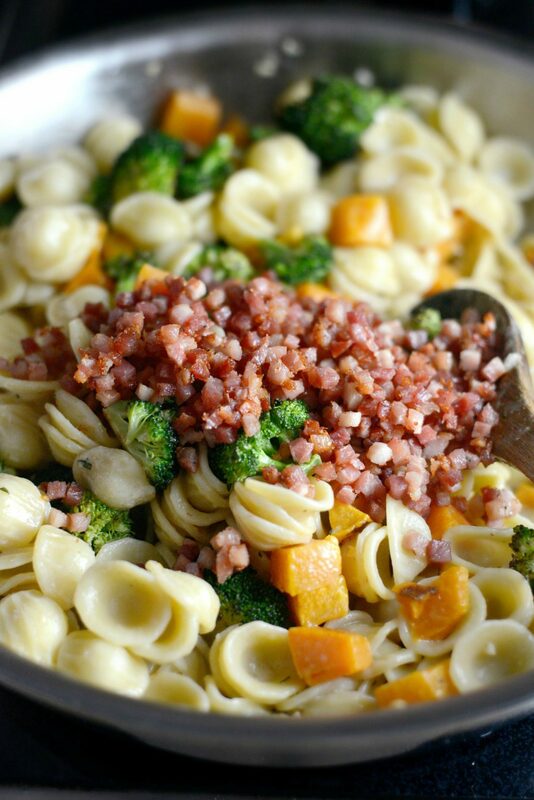 Now quickly add in the cooked pasta, roasted butternut squash, broccoli and pancetta. 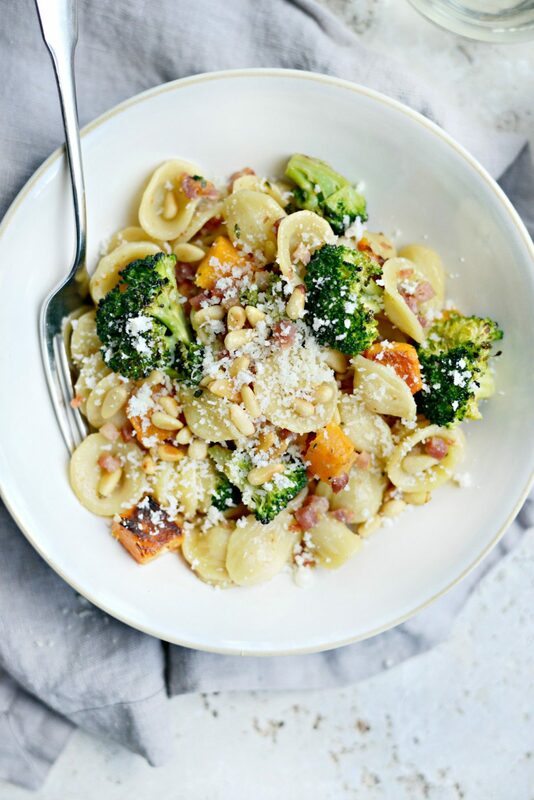 Lastly, serve with a sprinkle of toasted pine nuts and MORE grated Parmesan. 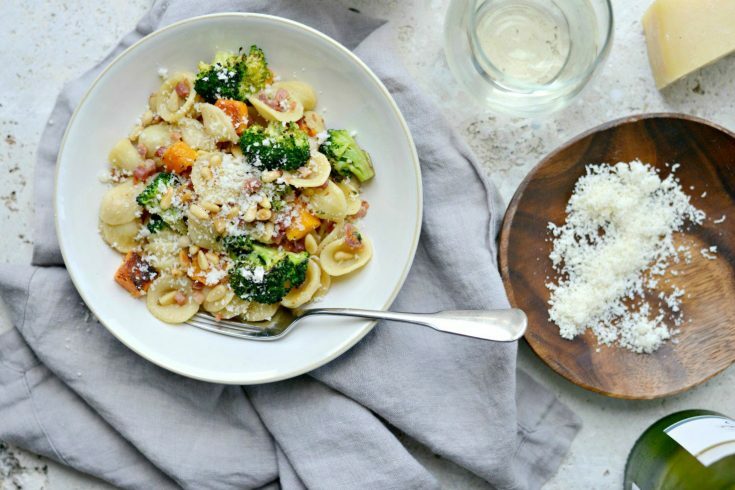 This orecchiette pasta was inspired by a dish I had in Utah last fall. 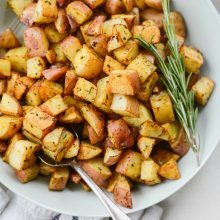 It’s wonderful as a light main dish or as a side dish to grilled chicken or salmon. Not much of a sauce here, just flavor and deliciousness. And leftovers reheat beautifully. 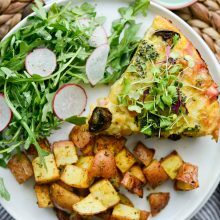 Preheat your oven to 425° and place the butternut squash and broccoli on two separate rimmed, metal sheet pans (quarter sheet pans work great for this). Drizzle with olive oil and toss with a pinch or two of kosher salt. Roast the squash for 20 minutes, rotating halfway through, until tender. Remove, set aside and increase heat to 500°. One preheated, slide the broccoli in and roast for 8 minutes, rotating the pan halfway through. Remove and set off to the side. Meanwhile bring a large pot of salted water to boil. Once boiling, add in the pasta and cook following the package directions. 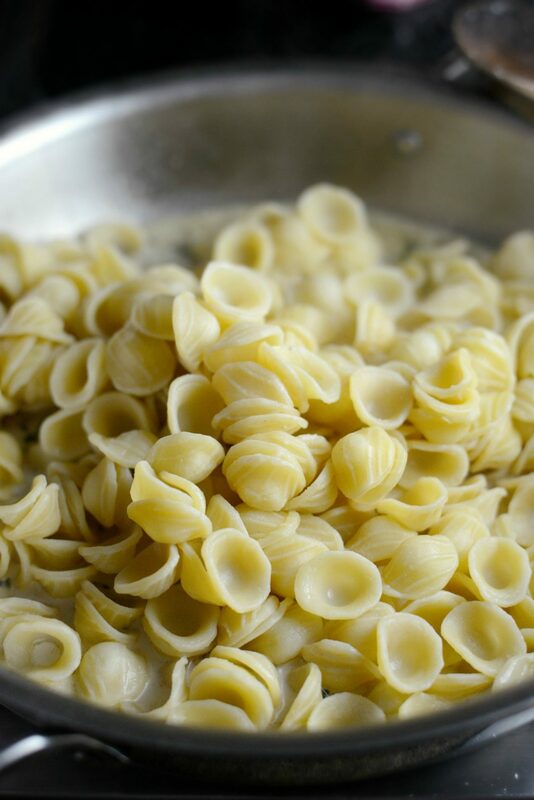 Once cooked, reserve 1 cup pasta water before draining pasta. 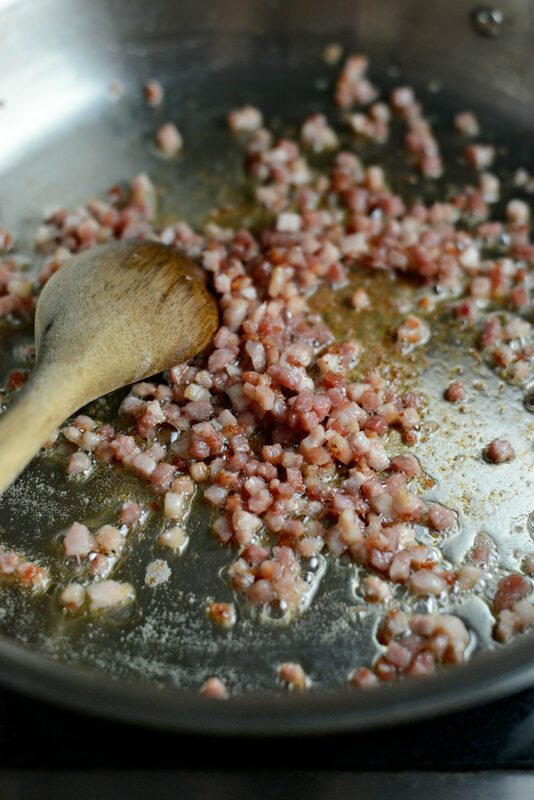 Add the 1 tablespoon of olive oil and the pancetta into a large, 12-inch skillet. Heat on medium and cook the pancetta until crispy, about 10 minutes, then transfer to a paper towel lined plate. 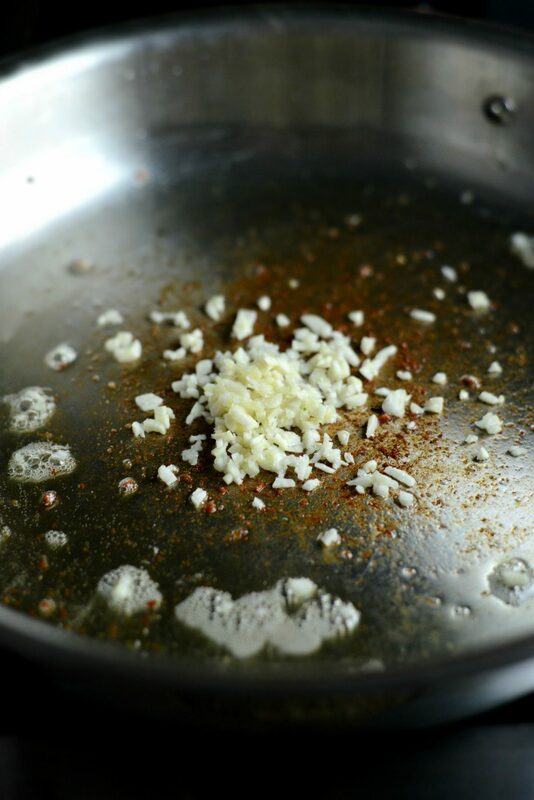 Add the garlic to the pan and cook for 1 minute. Add in the thyme and wine and cook until reduced to 2 tablespoons. Add in the broth and cream and stir. 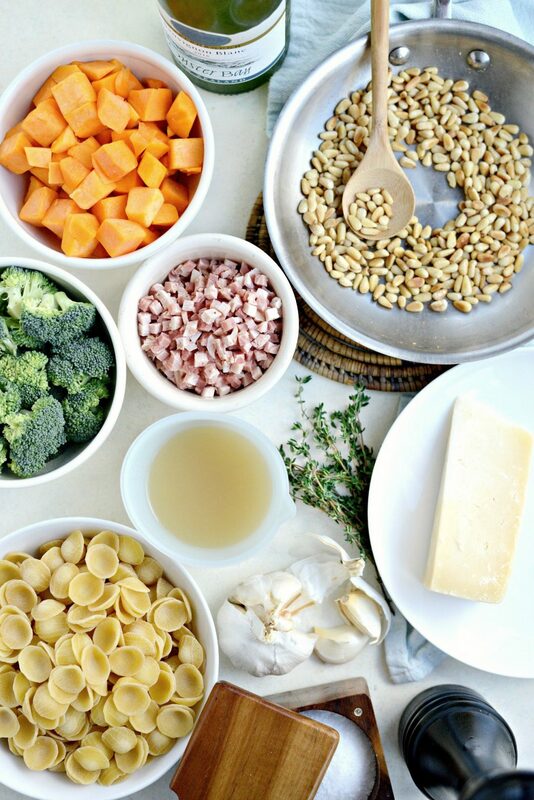 Immediately add in the pasta, squash, broccoli and pancetta. 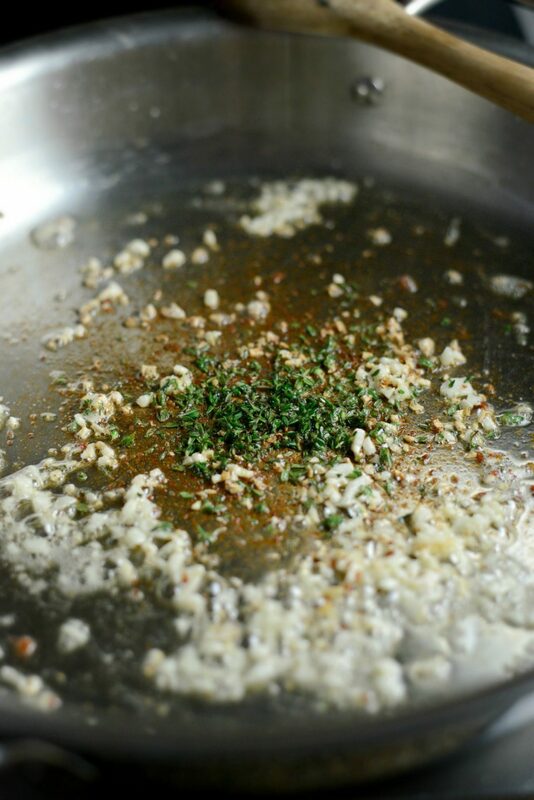 Stir in the Parmesan and season with kosher salt and black pepper. 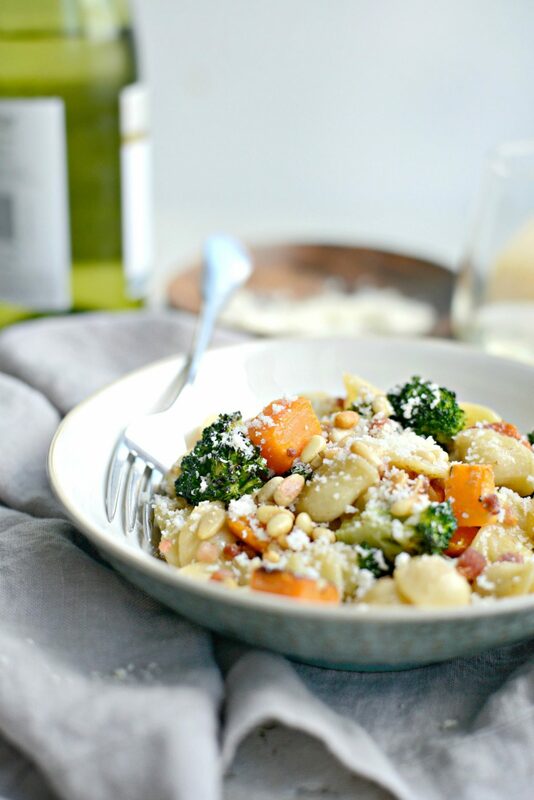 Serve with toasted pine nuts and more Parmesan cheese. 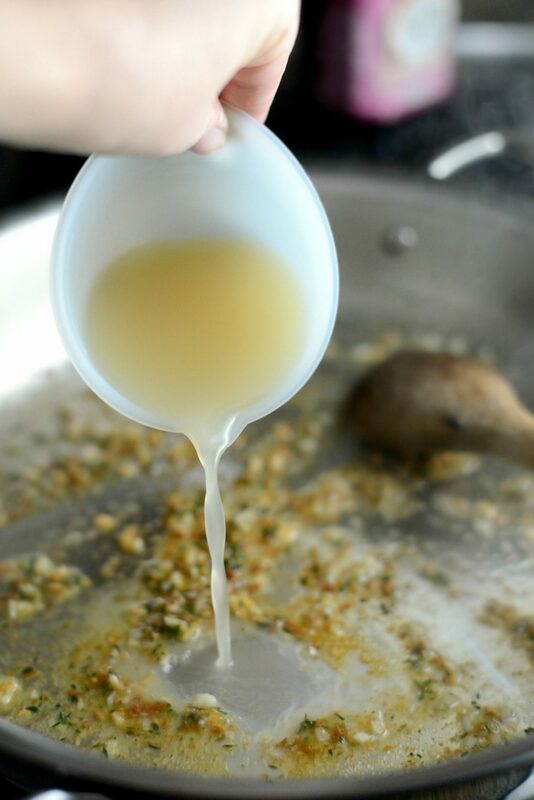 *Add pine nuts into a small skillet. Heat on medium to medium-low until fragrant and lightly golden brown. About 8 minutes.